Ashton College / Ashton Insider / Canadian Immigration / CELPIP versus IELTS: Which One Should You Take? If you are planning to immigrate to Canada, you know that language proficiency is one of the immigration requirements. High results on the language proficiency test can, in fact, make a big difference in your Express Entry Comprehensive Ranking Score (CRS). There are two options to meet English language skills requirements: taking the Canadian English Language Proficiency Index Program (CELPIP) or the International English Language Testing System (IELTS) test. Both tests are accepted by Citizenship and Immigration Canada; the question is, which is the best test for you? We broke down each test and their components below for your convenience. Both IELTS and CELPIP are designed to measure the English language proficiency of test-takers. The tests include four categories that capture the main aspects of the language: Listening, Reading, Writing and Speaking. CELPIP test was designed specifically to assess key language skills required for Canadian permanent residency and citizenship. The test uses Canadian English and accepts both British and American English spellings for its components. If you are taking CELPIP to apply through Express Entry, the CELPIP-General Training (four-skills tests) is required. IELTS is used for study, work and immigration. It recognizes both British and American English for spelling, word choice and grammar, and uses a mix of accents from native speakers throughout the test. IELTS is available in more than 140 countries and is divided into IELTS Academic (used for education) and IELTS General Training (used for migration to an English-speaking country). If you are taking IELTS to apply through Express Entry, the IELTS General Training test is required. CELPIP and IELTS are both approved and accepted by Citizenship and Immigration Canada (CIC). The final test score is compared to the Canadian Language Benchmark (CLB), which demonstrates national language standards for recognizing a second language. Below is the CLB comparison chart from the CIC website. For more information about the specific language requirements and the CLB, please visit the CIC website. The interesting thing about the CELPIP test is the fact that the Listening and Reading sections contain a few unscored items that are used for test development and improvement. According to the CELPIP website, unscored items are indistinguishable from the regular scored questions and can be found anywhere within those two test sections. Both tests have different preparation materials available for the students to both get ready for the test and to better understand the test style and format. IELTS has different practice tests and sample test questions available on the IELTS website. You could also purchase IELTS materials to study on your own or take preparation classes. Vancouver residents also have access to IELTS workshops. CELPIP is a younger test compared to IELTS, but it still has various options to prepare for the test. You can take sample tests or preparation programs to make sure that you are ready for the exam. Vancouver residents may also register for a pretest for the Listening and Reading sections of the test. There are several factors to consider when choosing which test to take. The table highlighting those factors is included below. Both CELPIP and IELTs are very accessible in Canada. CELPIP has 33 locations across Canada, in all provinces except Prince Edward Island (the test locations are currently unavailable in the three Canadian territories YT, NU, NT). They have also recently opened a location in the UAE in Dubai. IELTS has 119 locations, but only in five Canadian provinces (ON, QC, MB, AB and BC). It is important to remember that some locations only offer IELTs Academic, which is not accepted for Express Entry. On the other hand, only IELTS is available outside of Canada. The availability of both tests is given months in advance, so it is easy to plan ahead. The frequency of the tests offered depends on the specific province and the city. CELPIP exam price is less than IELTS. The cost of CELPIP-General test is $265 plus tax. IELTS price in Canada is $309 (including tax); however, certain places in Canada have a higher fee (e.g. $319 in Niagara Region and Windsor). Outside of Canada, IELTS has different prices, depending on the country in which it is offered. The time it takes to complete all the sections of the CELPIP and IELTS tests is approximately the same: around 3 hours. However, the duration of the actual tests differs. CELPIP is conducted in one 3-hour sitting. Since it is done on the computer, it is easy to keep track of how much time is left for each of the tasks. When going by sections, CELPIP seems to have longer Listening and Speaking sections and a slightly shorter Writing section. However, keep in mind that the CELPIP time breakdowns include the question, answer and transition times. IELTS test takers, on the other hand, do not necessarily complete all the test components on the same day. Although three of the test sections are completed in the same test room, the Speaking section is done separately at a different time, day and possibly location (it can be taken up to a week before or after the other sections). There is also no automatic computerized time tracking, and the times presented in the table above may not include the transition times between the test sections and components. The results take 13 calendar days for IELTs and 10-12 calendar days for CELPIP. If you are short on time and money is not an issue, CELPIP also has an express rating system: the score is available in three (3) business days for an extra $100 fee (plus applicable taxes). IELTS is a paper-based exam, while CELPIP is completely computerized. It may be more comforting for some people to do the writing section on paper and to keep track of their own time. Others, on the other hand, feel less pressure by the computer and prefer typing and being able to see their timing and word count. Also, the CELPIP test includes spell check in the writing component, which could be found useful by some applicants. 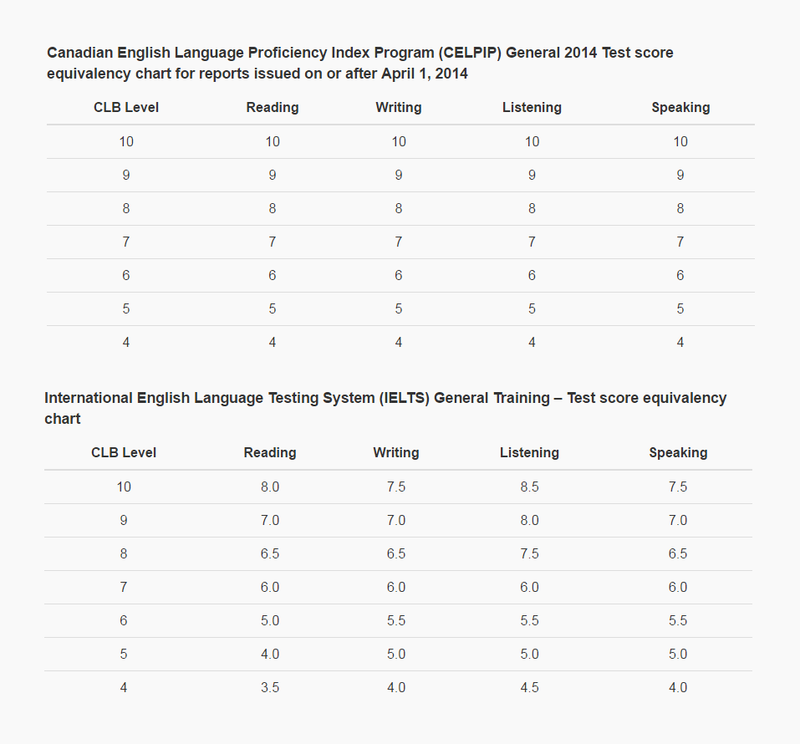 CELPIP test uses Canadian speakers, while IELTS test includes native speakers from Australia, Canada, New Zealand, the UK and US in their Listening section. Some non-native speakers may find the CELPIP Listening section more understandable. Also, when taking CELPIP, one is able to adjust the volume in the headphones for the Listening section to suit their needs. IELTS Speaking section includes a live conversation with an examiner, while during CELPIP you record your voice on the computer. Some non-native speakers prefer talking to an examinator, while others feel more comfortable without the face-to-face interaction. Both exams, offer online samples of their work and have prep courses across Canada. It may still be easier to find preparation materials for IELTS, since CELPIP is still relatively new. However, CELPIP prep courses seem to be more prevalent in Canada, and you can be sure of their quality when they are accredited by Paragon Testing Enterprises, the creators of the CELPIP Test. Both of the tests are equally appropriate to be used for your immigration application, and choosing one over the other can be a matter of personal preference. IELTS is a good choice for the test-takers who prefer paper-based exams and separate face-to-face speaking components, or those applying from outside of Canada. However, based on the analysis above, CELPIP is a better choice for those who prefer a computer-based exam and are looking for a faster and less stressful test experience. The article was updated on February 15 to reflect the changes in the IELTS and CELPIP exams. Ashton College offers an Accredited CELPIP Preparation Program, designed to prepare students for individual components of the CELPIP-General and the CELPIP-General LS tests. Very good post. I will have to make a choice as well.. Does any one have any Celpip practice test book? Just took CELPIP, If you are short on time then choose CELPIP, with respect to scores IELTS is much better, my speaking score in CELPIP is much lower (8.5 in IELTS and 7 in CELPIP). Two reasons: noise cause by other people speaking makes it hard to focus and the fact you’re speaking to machine, not human. I have hard time bit understanding the british accent, which test is preferable ? what is validity for CELPIP? any free practice test materials? Both IELTS and CELPIP are valid tests to take as your English proficiency tests. These are currently the only two English language proficiency tests accepted for your Permanent Residency application. When it comes to the accent, CELPIP uses Canadian speakers, while IELTS is more likely to use speakers from the UK, among other English-speaking countries. I want to ask about the sister concern of celpip test. Canadian Academic English language test is used for admission into Canadian universities. Best alternative to ielts academics…. Is cael more difficult than ielts academics?What is the passing rate of cael exam? Computer based one? Since everyone studies and learns at their own pace, I wouldn’t be able to tell you the exact timeframe it would take you to improve your scores. However, based on your score breakdown, you have a very good chance to score higher with a little bit of extra preparation! I would recommend taking a prep course: it would make you more familiar with the test expectations, help you improve your vocabulary and give you enough sample questions and examples to practice for the test. I would also recommend putting extra effort to practice, especially for the writing section. If you have any native speaker friend, engage them in your preparation! You can learn great nuggets from them. I think that in the listening part in the IELTS is more difficult than the CELPIP but I don’t know. I’ve taken the IELTS three times unfortunately, my band in the IELTS is 5 in the listening I haven’t been able to improve in this part yet. In my writing part I got 6. Also, Reading I believe that is more difficult in the IELTS. Do you think CELPIP could be an alternative? I am looking at applying for permanent residency. Both CELPIP and IELTS are accepted tests for permanent residency applications. You can definitely try taking CELPIP, as you may find the format more suitable for you. I would recommend preparing for the modules you are struggling with by taking practice tests or enrolling in a prep program. Hi, does anyone know if the Ielts score is counted on 1 seat only, or we can combine the scores of 2 test results and pick the highest scores of those to apply? Unfortunately, the score has to be counted based on one sitting, especially if you are using the test score for Canadian immigration or PR application. This is applicable for both IELTS and CELPIP. If i score CLB level 8 in my first attempt in CELPIP and thereby reaching the CRS score of 425. But i wish to take an another attempt to improve my score as the trend clearly shows that 425 is not sufficient enough to get the invitation for PR processing immediately. Hence i am taking an another attempt after 30 calendar days and end up in getting CLB score of 7 that might lead to reach even more low score of 405. In this case, can i use my first attempt result (CLB 8) instead of my most recent attempt result (CLB 7)? Please clarify, just curious. You are free to use the result of any acceptable exam (CELPIP, IELTS, etc.) as long as it was taken within the past two years. Hence, you can use the result of your first CELPIP attempt. Hi, are there test locations available in the US for CELPIP? I intend to take this test for the express entry application. Hi, am planning to apply for PR in Canada (with my wife). Will CIC accept CELPIP result for me and IELTS for my wife? Yes, you can use different tests for yourself and your wife. Please remember that the scores of the primary applicant have to meet the requirements of the immigration category you are applying under. Also make sure that you have the correct tests done: CELPIP-General Training test or IELTS General Training test. Please remember that academic IELTS will not be accepted by Immigration, Refugees and Citizenship Canada. For more information and advice, please talk to an immigration consultant or lawyer, or contact CIC Client Support Centre services. CELPIP General is a four-component test that includes Listening, Reading, Writing and Speaking. This test is accepted by Immigration, Refugees and Citizenship Canada (IRCC) when applying for permanent residency, including Express Entry applications. It is also accepted by the Real Estate Council of British Columbia and Immigration Consultants of Canada Regulatory Council (ICCRC). CELPIP General LS only has two components, Listening and Speaking, and is sufficient for Canadian citizenship applications. Can i undertake CELPIP test from india? I checked it in CELPIP.CA website, the test centers are given only for canada, USA and UAE. Unfortunately, India is currently not among the locations where you could take the CELPIP test. Current CELPIP test centres are only available in Canada, USA and UAE. But now, we have a CELPIP test center in India as well in Chandigarh, this is the only one location where CELPIP started. Have you appeared for CELPIP exam from India? If so, could you pls share your experience. I had recently scored L: 8, R: 9, W: 6.5, S: 6.5 in IELTS but need CLB 9 so now I am confused which exam I should appear for. Also, if possible kindly let me know where did you prepare it for. Now India also has test location in Chandigarh. Is there any place in UK where I can sit for CELPIP test? Both CELPIP General LS Test (for Canadian Citizenship) and CELPIP General Test (for PR status in Canada) are currently only available in Canada, Philippines, UAE, and US. I would be requiring L-8, R-7, S-7, W-7 in IELTS for my PR application. Can someone let me know, what should be the equivalent score in CELPIP? Absolutely! You are required to score 9+ in each module of CELPIP. You said both IELTS & CELPIP ar equal in their difficulty level, Then Why there is a conversion factor in CLB for IELTS and not for CELPIP. I am able to get 8 in all modules in IELTS so my CLB score went 9+….when i attempt CELPIP, due to same difficulty level i get 8 in all modules and my CLB score is 8 only..why this discrimination in evaluation methodology between the two exams? The scale of evaluation is different for each of these tests. An 8 band in IELTS isn’t equivalent to 8 band in CELPIP. That’s why you are seeing the discrepancy while comparing to CLB. That’s coz the CELPIP is out of 12 and IELTS is out of 9. I have taken IELTS test 5 times but i didn’t get more than 6 in writing.Except writing i got my required score for CLB level.Finally, i am preparing for CELPIP and hopefully i’ll achieve my required score. We wish you the best of luck! Please talk to our Admissions Officer if you encounter problems or require some extra help in preparing for CELPIP! If we take more than two CELPIP tests, then could we choose which results to be presented as immigration requirements? Hi,its difficult to find training centres or trainers to practice for CELPIP -UAE ,what if i approach the ielts trainers for the celpip test. CELPIP and IELTS are two different tests. If you wish to get an effective training for CELPIP, we highly recommend finding an instructor who has experience preparing students for this test and knows specifics of its format. Good day. I am tired of Ielts due spelling. do CELPIP Has spell check for writing and reading? I scored 7 in speaking, in writing 6. I did badly in rest. Do u think the CELPIP has any advantage of people like me??? The level of difficulty is approximately the same in both tests. However, certain sections can be viewed as easier or more difficult by individual test-takers. Our experienced instructors will be happy to help you preparing for your exam if you take a decision to try taking CELPIP. Please do not hesitate to contact our Admissions Officer at admissions@ashtoncollege.ca OR (604) 628-5784. Can I do CEPLIP exam to work in Canada as a Doctor? I already have my PR card. Assume i have a score of L-8, R-7,W-7, S-7 in IELTS. What is the equivalent score in CELPIP? What countries are required to take the test? What exactly are you looking to take an English exam for? I have taken CELPIP twice and I have problems with Speaking, I don’t get more than 6 and I’m desperate. I’m thinking to take IELTS but maybe I’ll lose points in the other parts, and waste of money again and again… On the other hand, I can’t understand how the rest of grades have changed in two weeks drastically when my English level is the same…I don’t think CELPIP measures English level properly…i think you have to learn the techniques. From which country this CELPIP can be taken. CELPIP exam is currently offered in Canada, United States, United Arab Emirates, and Philippines. I live in Detroit, USA. I am not able to get an immediate slot for IELTS. So, can I book CELPIP slot in Canada? (I can easily drive there). Will they mail the test score hard copy to my USA address ? Hi Would like to check if CELPIP General Exam is available in California? I can see the option but City is not being displayed. Thank you for the priceless information. please which site can i get to download some materials for IELTS for personal study. Moreso, how will one get to send the result to Canada when applying as an immigrant through Express Entry. There are various resources available online for free and for a fee as well. You can look through them at your own pace via a quick search on Google. A lot of instructional videos are available on YouTube as well. For express entry, you will be getting an option to upload your documents to your online profile. Very informational and useful for students who are still in confusion which test to take. After reading the post they can make their mind which one to choose. Thanks for the feedback and encouragement Afshin. Thanks for your comment. I have personally appeared for both tests and the only thing I can say with reasonable certainty is that the difficulty level will really depend on an individual’s strengths and weaknesses. From my personal example, I can tell you that I found writing part in CELPIP easier to attempt because I am used to typing on keyboard and my handwriting is barely legible. Having said that, in my case, attempting the writing section was a matter of skill of execution rather than the actual skill in using English as a language. Likewise, someone may prefer attempting handwritten answers over typing them on a keyboard. I would strongly encourage you to go through the format of both exams and see how do you feel about attempting each one of the sections. Wishing you all the very best. I SCORED 8 BANDS OVERALL IN ACADEMIC IELTS….BUT FOR PR I HAVE TO APPEAR IN GT…IS CELPIP THE BEST CHOICE OR SHOULD I GIVE IELTS GT. It’s really up to you to make this choice. Please refer to the article above for the list of differences between the two exams. Is celpip test available in India if yes then could you please give me location. Is CELPIP now available in India? Thanks for sharing the useful details. I definitely go for CELPiP .. but my question is that is there any negative marking if we select wrong answers? Yes, the wrong answers will affect your score. Can i use IELTS for Speaking and Listening & CELPIP for reading and writing? You will need to choose just one test for all the modules. It’s very clear and understandable. Appreciate the effort behind this article. I am from India so obviously I have to go with IELTS. Hi, I am 19 years old and from India. I am currently pursuing B.A in English Honors and plan to go to Canada for my Masters. Can I Give CELPIP instead of IELTS? Both tests are accepted by Citizenship and Immigration Canada for the visa and immigration purposes. I have a very clear input for anyone comparing CELPIP vs IELTS and a strong suggestion that if you need the maximum points for language then taking the CELPIP test is a wrong move! I have taken IELTS twice in the past and both have expired so I took the CELPIP test now and got a truly shocking result. In the past my IELTS scores were all in the 8,5 to 9 area for all 4 disciplines . The Celpip results were 11 or 12 for all except the written which was an 8!!! Now there is a statistically valid correlation between the 4 elements and this was way out. So I asked some of my also English speaking professional colleagues who had taken the Celpip test and they all had a similar experience. I asked for a re-mark but that delivered no change. Now as the Canadian system awards points based on the LOWEST mark obtained, my advice is stay away from CELPIP, there is a definite issue with their written marking system part of which is related to the stupid subjects presented – typically how can you show your command of English writing an email to t Restaurant Manager complaining about the service ????? some one can clear my doubt about CELPIP writing test . is there option for check the spelling mistake in writing task ? The CELPIP Writing Test does include an automatic spelling checker, but keep in mind that it is sometimes difficult to choose the right word when the spelling checker offers you a choice. I wanted to ask if I couldn’t be able to achieve required score in any one module oF CELPIP so should i have to give the complete test again or only the required module? Unfortunately, you will need to retake the complete test again to improve your score. In IELTS Reading test, one can skip the question when not sure and require more time to read the article again and come back later when time is remaining. Does CELPIP offers similar feature to User to skip a particular question or section and respond later before submitting? According to the official information on CELPIP website, on many parts of the Reading Test, there is no opportunity to go back and change your answer. So, to make sure you complete the whole test, you’d better answer all the questions in their sequence.